Description: Everyone needs a home, even the Smooshees! This set includes a house full of furniture for the Smooshees Cuddler line. The Cuddler line includes Smooshees that are humans opposed to animals. These human Smooshees are made of soft stuffed fabric with pre-printed faces, hair and outfits. 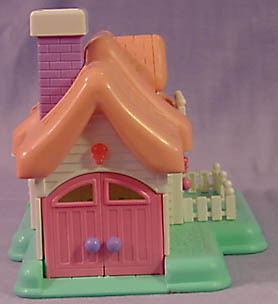 This house set was sold with one Smooshee girl, Jenny, as well as bedroom furniture and a backyard swing. 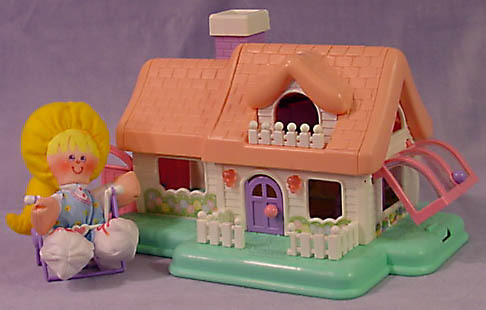 Jenny is not marked with a model number, but was sold with a sewn-on tag marked "Fisher-Price" and the trademark "S" for Smooshees. Designed for children ages 4 years and older. FPT16125 - Small 2 story white house with a pink molded shingled roof and a light green "yard" base. The front lower level of the house has an arched doorway for the removable door, a small pink "light fixture" on each side of the doorway, a small open window to the right of the door, and a large open garage window on the left of the door. The top level has an arched open window/door with a roof above it and a small balcony ledge below with 2 holes for a removable rail. The left side of the house has a garage with holes in the corners to attach 2 removable driveway doors. The right side of the house has a rectangular window with holes on the sides to attach the removable greenhouse. When the greenhouse is attached, push down the built-in lip on the base to release a lever to open the greenhouse (tilts upward). The back of the house has a lift-up pink roof with an open sunroof in the center...lift the roof to see the 2nd level inside the house. The back of the house also has a white fold-down removable patio that doubles as the back wall. Measures 9-7/8" wide, 5-3/4" tall, 6-5/8" deep. FPT19636 - Square brick-simulated purple chimney with a white rim around the top opening. The bottom opening is angle to fit on top of the FPT16125 house. Measures 2-15/16" tall, 1-1/4" wide, 1-1/4" deep. FPT19637 - Small greenhouse with a pink plastic frame, clear plastic walls and curved roof, and a purple knob on the front bottom. The greenhouse attaches to the side of the FPT16126 house. *See "Variations" below. FPT16126 - Small purple front door with an arched top, 2 pie-shaped window holes in the top, and 2 long rectangular recessed panels under the windows. The door has a large round pink knob. *See "Variations" below. FPT16127 - Left-side pink garage door with a half-arched top (shorter on the left side than on the right side). The door has an arched triangular open window across the top (with a point on the left side), and 3 recessed rectangular panels molded in the bottom section. The door has a large round purple knob on the right side. The door has a short round peg on the top and bottom corner of the left edge. *See "Variations" below. FPT16128 - Right-side pink garage door with a half-arched top (shorter on the right side than on the left side). The door has an arched triangular open window across the top (with a point on the right side), and 3 recessed rectangular panels molded in the bottom section. The door has a large round purple knob on the left side. The door has a short round peg on the top and bottom corner of the right edge. *See "Variations" below. FPT16129 - Small white fence piece that fits in the 2nd story window of the house. The fence has 6 rectangular posts with round balls on top and small round balls between each post. The bottom of the fence has 2 pegs that fit into holes in the 2nd story window balcony. FPT16130 - Small white L-shaped fence piece that fits on the left side of front door in the front "yard". The fence has 4 rectangular posts on the front with round balls on top of the 2 end pieces, and round balls between each post. The right-side end post and the post beside the left-side end post have a small round peg on the bottom to fit into holes in the house base. The left-side post has 3 posts behind it with small round balls dividing the posts. The post on the very end has a hook that attaches to the side of the house (left side of the door). FPT16131 - Small white L-shaped fence piece that fits on the right side of front door in the front "yard". The fence has 4 rectangular posts on the front with round balls on top of the 2 end pieces, and round balls between each post. The left-side end post is backward C-shaped and designed to hold a removable fence gate. The left-side C-shaped end post and the post beside the right-side end post have a small round peg on the bottom to fit into holes in the house base. The right-side post has 3 posts behind it with small round balls dividing the posts. The post on the very end has a hook that attaches to the side of the house (left side of the door). FPT16132 - Small white picket fence gate/door with an arched top and a purple heart in the center. The door attaches to the FPT16131 right-side "yard" fence. *See "Variations" below. FPT16133 - White fold-out patio that attaches to the back of the house as the back wall. One side is white shingle-simulated (to matched the exterior of the house) with a paper litho window in the center, and a curved handle attached to the top. The other side has diagonal recessed lines to simulate a porch. The porch has a fold-down extension with molded-in stairs on the end. The porch has paper 3 litho flower arrangements on yellow backgrounds. FPT16134 - 2 each - Square purple chair with rounded arm rests on the sides, and an arched backrest with a molded heart shape on the backrest covered with a pink heart paper litho. The chair does not have a seat....the seat is hollow. The pink heart litho may be missing. FPT16135 - Round pink table that resembles a thread spool. The top of the table has lines across to simulate wooden boards. The table has a hole in the center to attach the accessory table umbrella. FPT16136 - Yellow 6-sided table umbrella with lattic simulated designs on the sides. The umbrella has a hole in the top to attach the accessory pole. FPT16137 - Yellow 3-1/2" long pole with a round ball on top, and a small lip under the pole to attach to the 6-sided table umbrella. FPT16138 - Small rectangular purple bedroom dresser with an arched panel across the top front. The panel has a round ball on top of each end and a molded double heart shape in the center with a pink paper litho heart in the center. The pink heart litho may be missing. The dresser has a removable drawer, and 4 half-circle leg posts on the bottom. FPT16139 - Small rectangular purple dresser drawer with 2 small recessed rectangular panels on front, and 2 small round purple knobs on the front. The drawer is enclosed on 5 sides, and open on top. FPT16140 - Purple rectangular bed with an arched headboard and footboard that have molded double hearts in the center covered with a pink paper litho heart in the center. The pink heart litho may be missing. The bed has decorative rounded posts on all 4 corners with a round ball on top of each. The sides beside the headboard are a bit more narrow than the sides beside the footboard, making it appear as though the bed has adjustable lengths, but it doesn't. The original design in the 1988 Fisher-Price Dealer catalogue shows the bed with a pillow panel....apparently the pillow panel was dropped, making the bed look a bit odd. The top of the bed has a rectangular opening, and the inside section of the bed is hollow. FPT16141 - White wood-simulated swing with a safety bar across the front of the seat. The bar has a heart shape in the center with a pink paper litho heart over it. The pink heart litho may be missing. The swing has attached posts on the sides with rounded balls on the top sides to attach to the swing frame. FPT16142 - Purple swing frame that is A-shaped on the sides with a large purple molded heart across the center. The top of the A-shaped sides has rounded c-shape clips that the posts on the yard swing attach to. The bottom of the frame is rectangular with an H-shaped support bar in the center. FPT14811 - Jenny - Small stuffed Smooshee Cuddler female doll with a pre-printed face and clothing. Jenny has yellow fabric hair with a long ponytail in the back, blue eyes, a red nose, round pink cheeks, and a red line smiling mouth. She wears a blue sleeveless outfit with yellow flower designs and pink "stitch" trim over a white long-sleeve shirt with blue line trim and pink dot "buttons". She has white "shoes" with pink printed shoelaces. 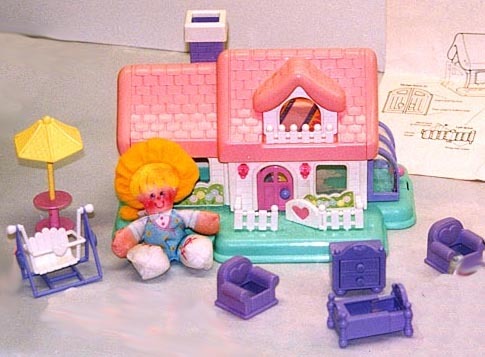 Jenny was not marked with a model number, but was sold with a sewn-on tag marked "Fisher-Price" and the trademark "S" for Smooshees. FPT16144 - Small pink front door with an arched top, 2 pie-shaped window holes in the top, and 2 long rectangular recessed panels under the windows. The door has a large round purple knob. FPT16145 - Left-side purple garage door with a half-arched top (shorter on the left side than on the right side). The door has an arched triangular open window across the top (with a point on the left side), and 3 recessed rectangular panels molded in the bottom section. The door has a large round pink knob on the right side. The door has a short round peg on the top and bottom corner of the left edge. FPT16146 - Right-side purple garage door with a half-arched top (shorter on the right side than on the left side). The door has an arched triangular open window across the top (with a point on the right side), and 3 recessed rectangular panels molded in the bottom section. The door has a large round pink knob on the left side. The door has a short round peg on the top and bottom corner of the right edge. FPT16147 - Small white picket fence gate/door with an arched top and a pink heart in the center. The door attaches to the FPT16131 right-side "yard" fence. FP7230BOX1988 (Box ONLY) - Sold in a 10" long, 13" high, 5-3/4" deep box. WFL: 07-AE-17-5-A. FP7230SET1988 - Complete set in original box.